365 days a year we offer Free Shipping when you spend $150. Free shipping offer when you spend $150 applies to most orders, however some restrictions may apply. All items are shipped from our facilities in approximately 1 to 2 business days unless otherwise noted. If the item is in stock it will ship same day if it meets our shipping cut off time of 8am Pacific Standard Time. If you do need same day shipping after cut off time you are welcome to call us and arrange if possible. Standard shipping is USPS or UPS Ground depending on size and distance of item that is being shipped. Heavier items are shipped via UPS Ground. IMPORTANT Shipping NOTE: We now offer weight based shipping. We offer free standard shipping on many of our items. Items excluded from free shipping are most fitness poles and most car waxes over a certain weight, however we will call you before shipping and processing to get a proper quote. For products that are in stock, we can UPS overnight, 2nd day, or 3rd day your order. Also most Hawaii, Canada and APO/FPO don't qualify for free shipping. All International, APO/FPO, Hawaiian and Alaskan orders can be charged additional shipping costs plus handling fees if applicable, we will contact your first before shipping so not to be concerned. APO/AE/FPO any Laser Pointer Orders will not be charged shipping unless it is for a large quantity of items. 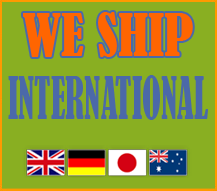 We ship to over 200 countries. The shipping method for items less than 4 pounds is First Class Mail International. For items 4+ pounds we use Priority Mail International, UPS or DHL depending on the item and its destination country. If you prefer to buy from our EBAY.com store, many of our products can be purchased there. If you are interested in being an International distributor an receive wholesale pricing, please call or email us.